Please provide brief responses to the questions below and an electronic copy of a photo that you would like to appear in the parish bulletin. We will follow up with a draft of the piece for your review and approval before we publish it. Responses may be edited to fit space and style requirements. How long have you been attending Mass at St. Vincent de Paul? I have been coming to St Vincent’s for almost two years now. Where did you grow up? I am originally from Bloomington/Normal, Illinois. Where did you go to school? I went to Central Catholic High School. What do you do professionally (or what types of volunteer or other activities do you participate in)? I work for a tech company called Shiftgig in the West Loop, and am building an anti-aging business with my girlfriend as well. What do you like most about St. Vincent de Paul parish? What I like best about St Vincent’s is the feeling of home that I get when I come here. I grew up in a church that had high ceilings, big stained glass windows, statues on each side of the altar and a choir loft with a beautiful big organ. I absolutely love the choir at 10:00AM Mass, and love the convenience of living down the street. Additionally, getting involved as a lector and Eucharistic minister has brought my faith life alive, and has brought me closer to Christ. 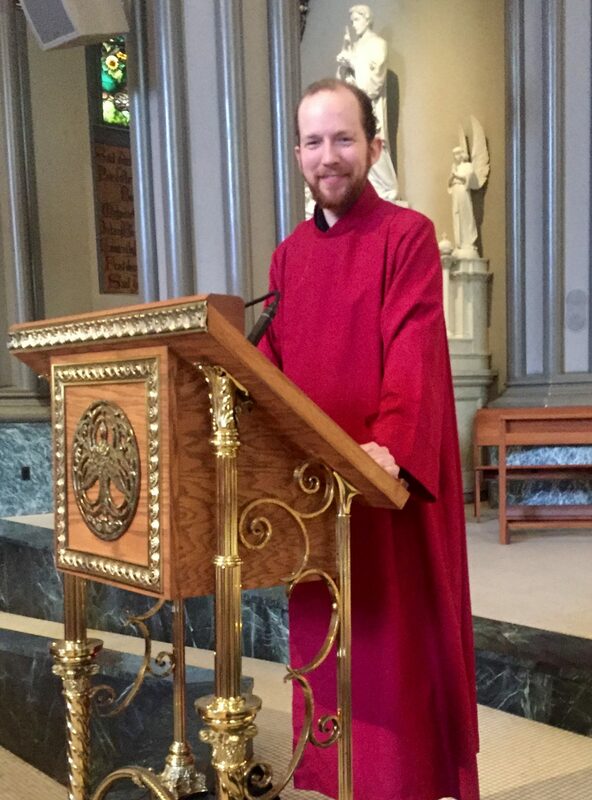 It has been a privilege to serve my new parish. How long have you been attending Mass at St. Vincent de Paul? I have been attending for three years now. Where did you go to school? I went to school at the College of Wooster (in Ohio) where I majored in Business Economics and was a member of the baseball team. What do you do professionally (or what types of volunteer or other activities do you participate in)? I am a Senior FP&A Analyst for W.W. Grainger and I am the head coach for the sophomore baseball team at Carmel Catholic High School in Mundelein, Illinois. What do you like most about St. Vincent de Paul parish? The community and the parishioners are what make St. Vincent de Paul so special to me. I have never met a group of people who care so passionately about their mission and always find a fun and entertaining way to practice their faith! I will never forget the first time I went to Mass and was informed by Father Jeremy that Wednesday night was “Stump the Priest Night” at a local neighborhood bar! What do you do professionally (or what types of volunteer or other activities do you participate in)? Public Health Dentistry (treating communities versus individuals). Additionally, I sing with the Chicago Gay Men’s Chorus and serve on the board of the National Network for Oral Health Access. What do you like most about St. Vincent de Paul parish? I enjoy the good preaching, good music, and good community. As a lector, I also like to proclaim the Word. What do you do professionally (or what types of volunteer or other activities do you participate in)? I am an editor and proofreader for legal and educational publications. What do you like most about St. Vincent de Paul parish? The music, the people, and especially the choir. What do you like most about St. Vincent de Paul parish? I like the openness and generosity of my fellow parishioners, and the dedication to helping the needy. I love the music at the 10:00am Mass. The quality and variety of music is outstanding. What do you do professionally (or what types of volunteer or other activities do you participate in)? I work part-time for Re/Max Synergy in Flossmoor, IL. I live with my husband of 43 years, in Lansing, IL, and sing funerals for two churches nearby. 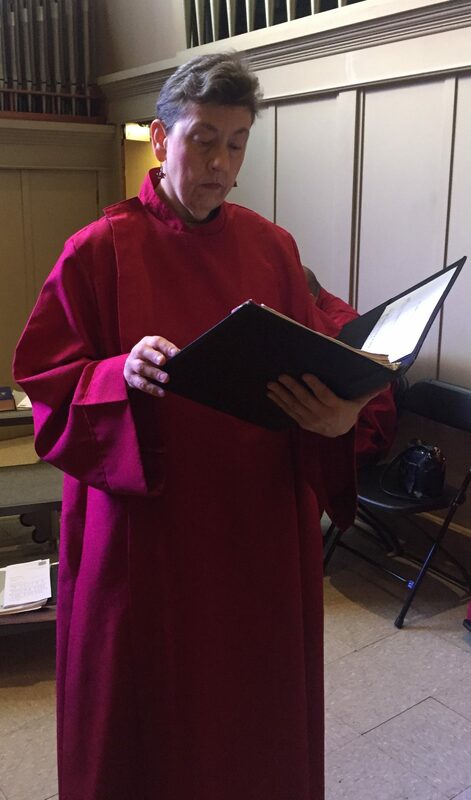 Have been served as a cantor at St. Vincent’s since the late 90s when I was still singing at Holy Name Cathedral (20 years), but joined the St. Vincent Chorale in 2002. I am also a quilter and belong to a quilt guild in the South suburbs. What do you like most about St. Vincent de Paul parish? I love singing in the choir; the music program is so rewarding and challenging. The music is praise-centered, liturgically-pertinent, and definitely to my taste. All the choir members get along and I feel I am part of a team where everyone is needed. I’ve enjoyed worshipping at St. Vincent’s. Chris: My friends introduced me to the church on Ash Wednesday in 2014, and I have been coming ever since! Becky: I’ve been attending Mass at St. Vincent de Paul for about three years. Chris: I grew up in Orland Park, IL which is a Southwest suburb near Joliet. Becky: I’ve lived in Chicago my entire life (with the exception of college). Chris: I attended the University of Illinois at Urbana Champaign for my Bachelor’s and Master’s in Statistics. My parents, brother, and sister all attended the University, so I guess you can say we are an orange and blue family! Becky: I attended the University of Illinois at Urbana Champaign for my undergrad. What do you do professionally (or what types of volunteer or other activities do you participate in)? 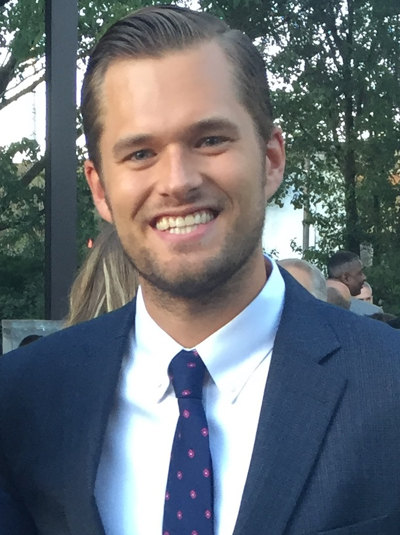 Chris: I am a data scientist at a large, commercial insurance company in the Chicagoland area. I work in predictive analytics to provide tools to claim adjusters and underwriters to make data-driven decisions. In my free time, I enjoy running. I have completed a marathon, half marathon, and various other races throughout Chicago. I also umpire high school baseball which is a nice change of pace to the everyday routine. 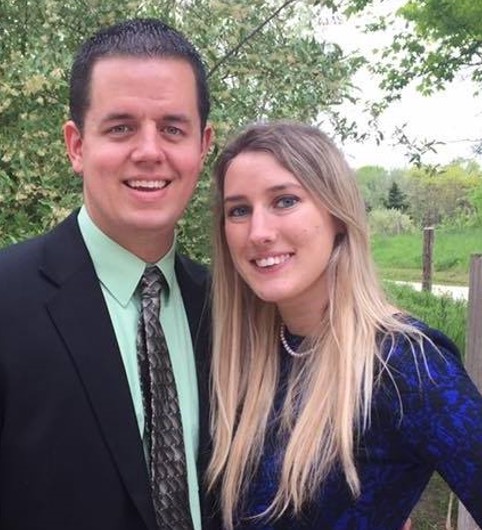 Becky: I’m currently working downtown Chicago as an actuarial consultant. Outside of work, I enjoy playing tennis, traveling, and my big project this summer is to create my first outdoor garden (growing variety of vegetables and fruits). Chris: I love the sense of community at St. Vincent and how the parish is part of the DePaul campus. There are a lot of fun events and opportunities that St. Vincent offers, and I have always felt welcomed at any of the events I have attended. Becky: I’ve met so many wonderful people at St. Vincent de Paul, and have enjoyed the various events and volunteer opportunities offered during the year. B.A. from Knox College, Galesburg, Illinois; also attended Loyola University’s junior year abroad program in Rome, Italy. I’m a freelance strategic marketing consultant always looking for new opportunities to help organizations and companies reach out to their audiences and tell their stories. Music and food are my passions, so I consider myself lucky to be able to volunteer both with the St. Vincent de Paul Chamber Chorale as an alto and as a market resource at Green City Market, the city’s only local, sustainable year-around farmer’s market. My mother and I joined the parish in 1999, so I could join Bob Beatty and others I knew from singing in the choir at Holy Name Cathedral. 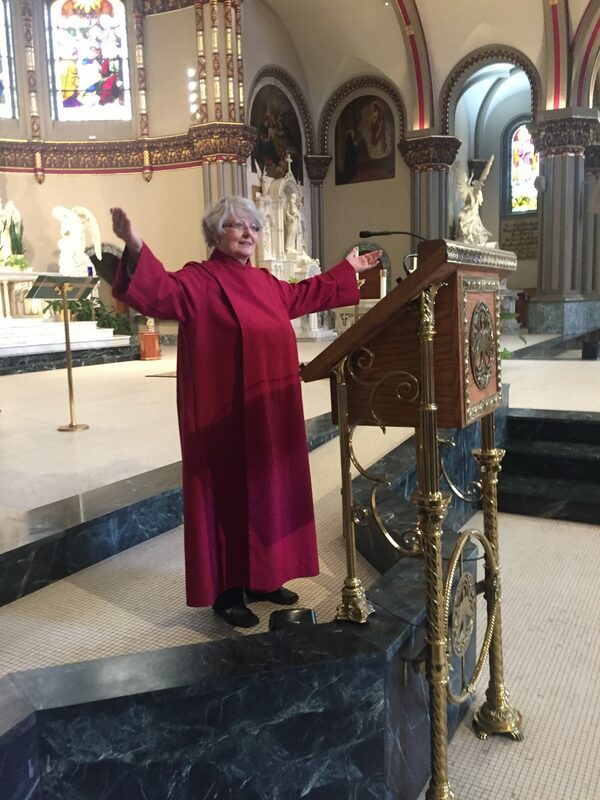 My mom had to come to Mass early each week so that I could warm up with the choir. She was soon surrounded by parishioners who sat with her and made her feel welcome every Sunday for fifteen years. I will never forget that kindness and warmth. What do you do professionally (or what types of volunteer or other activities do you participate in)? Sing! What do you like most about St. Vincent de Paul parish? I like the giving and charitable, all-inclusive spirit of the entire parish! How long have you been attending mass at St. Vincent de Paul? Two years. Where did you go to school? B.M. in Music Education from University of South Carolina; M.M. in Voice Performance from Roosevelt University. What do you do professionally? I am musician and a part-time barista. I am currently teaching myself Python programming for data analysis. What do you like most about St. Vincent de Paul Parish? I like the warmth and openness of the many parishioners I meet, and the chance we are given to perform some stunning music every week! How long have you been attending mass at St. Vincent de Paul? Ryan has been attending St. Vincent de Paul since June 2014, and we have been attending together after we got married in July 2015. Where did you grow up? We both grew up in Indiana. Ryan is from West Lafayette, IN and Bridget is from Fort Wayne, IN. Where did you go to school? We both attended Purdue University, which is where we met. Boiler Up! What do you do professionally? 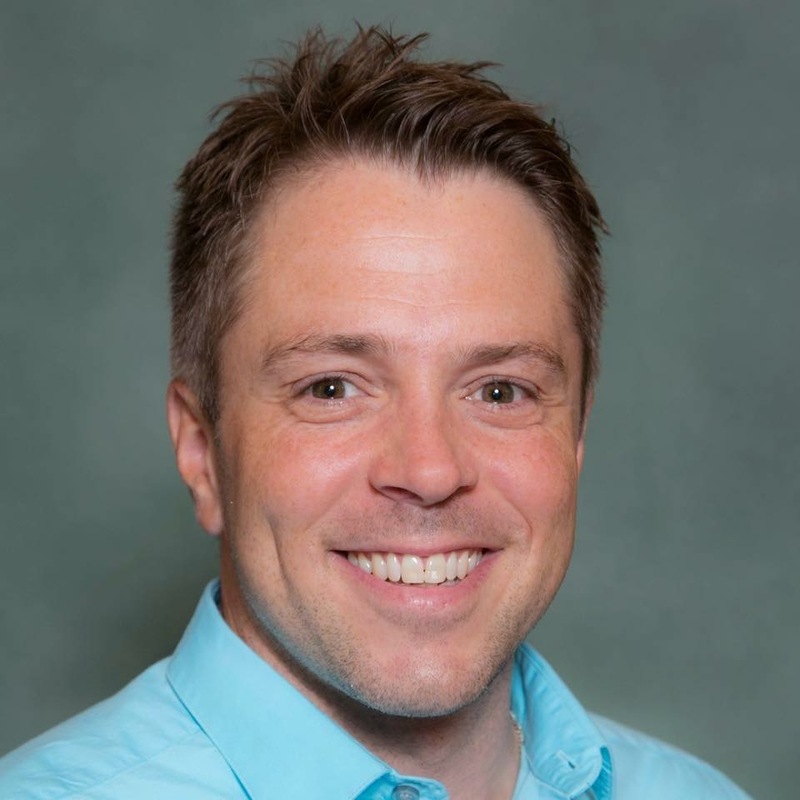 Ryan is a project manager for John Burns Construction company – an electrical contractor improving the lighting and communications infrastructure in Chicagoland. Bridget is a computer programmer for Technology Services Group – a computer consulting company based in downtown Chicago. What do you like most about St. Vincent de Paul Parish? The people! We love being able to share our faith with such a lively and caring community. We also thoroughly enjoy the magnificent choir and the beauty of the church. How long have you been attending mass at St. Vincent de Paul? I’ve been playing piano for St. Vincent de Paul for about three years now! Where did you grow up? I grew up in Ridgewood, New Jersey for about nine years and in Simsbury, Connecticut for nine years as well. Where did you go to school? I did my undergraduate at DePaul University and my Masters at Roosevelt University. What do you like most about St. Vincent de Paul Parish? I love the community and the mission that St. Vincent de Paul stands for. I find it very inspiring and it pushes me to be the best human I can be. How long have you been attending mass at St. Vincent de Paul? I have been attending mass here for 14 years, becoming a member in 2001. Where did you grow up? I grew up in Franklin Park, Illinois near O’ Hare airport. For the first 15 years of my life, we lived next door to my grandparents who emigrated from Italy to Chicago, a great experience. Where did you go to school? I went to St. Maria Goretti Elementary in Schiller Park, Holy Cross High School in River Grove, Triton College in River Grove and The American Academy of Art in Chicago. I have a degree in Fine Arts and Illustration. Currently am enrolled in a course at The International School of Comics in Chicago. What do you do professionally? I freelance as a product designer and illustrator and regularly write articles for Inside Publications a north-side newspaper. With my background in design I’ve created children’s arts and craft products, Happy Meal toys, premiums for cereal companies (the fun toys at the bottom of the box) and children’s school supplies. Currently I’m doing illustrations for a story that I’ve written. What do you like most about St. Vincent de Paul Parish? I love the parish location, its vitality, its beauty and the opportunities to serve. I am a longstanding member of the Communications Commission, contributing expertise in the graphic arts. I’ve consistently volunteered for the Garden Walk and serve as an usher whenever I can. I will be married at St. Vincent’s in October of this year and very much looking forward to it! I am proud to call St. Vincent de Paul, my parish home. How long have you been attending mass at St. Vincent de Paul? I have been attending since Ash Wednesday 2014. In undergrad, I sang at SVDP with MSU Men’s Glee Club. My cousin also had her wedding at the church in August 2009. Where did you grow up? I grew up in Haslett, Michigan, a small suburb outside of Lansing. However, having family connections to Chicago, I have always considered it a substantial part of my upbringing. Where did you go to school? I am a second generation Haslett High School grad and Michigan State Alum. Go Green! Currently, I am finishing my master’s degree at DePaul in public administration with a concentration in metropolitan planning and urban affairs. What do you do professionally? Besides graduate school, I work at a non-profit committed to making places healthier, more vibrant, livable and walkable. Also, I am passionate about family histories and am a staunch supporter in re-uniting people with the stories from their past and the relatives whose experiences impact their future. I like to keep busy, connect people with each other, and spend time with family and friends, and travel. What do you like most about St. Vincent de Paul parish? I love the atmosphere, the Vincentian mission, and most of all the people. I enjoy singing in the Sunday 5 p.m. choir, regularly attend TnT events, and I am part of the men’s bible study. Favorite parish activities outside mass: I love Taizé prayer (Thursday nights at 7). It’s a great way to sit in song and silence and meditate on what God is trying to tell you. Last Lent, we paired it with a Scripture Study, and that was a fantastic program that I hope we do again; not only did I get to center myself with Taizé, but I also got to learn more about our people’s history and culture through study. What led you to attend mass at St. Vincent de Paul initially and why have you chosen to become a parishioner here? I was (and still am) a DePaul student. When I was an undergraduate, I was heavily involved with Catholic Campus Ministry, but as I shifted from collegiate life to post-grad life, I realized I needed an adult community to call my home. I did “church shop” for a while, but I ended up right back here at St. Vincent’s, singing with the 10am choir and playing flute with the 5pm choir. What do you value most about going to mass every week? I have always loved attending Mass—even when I’m out of town, I search for a church to attend. First of all, I find liturgy fascinating: we have ancient traditions that we use to help us grasp the mystery of God. Thanks to academia, I now love scripture, and looking for links and “themes” is fun in addition to a good spiritual exercise. Mostly I attend Mass for the Eucharist: there’s something truly special about receiving the true presence of Christ. It reminds me to see Christ in everyone around me, as well as to look for Christ within myself. What does living your faith mean to you? Living my faith means not being complacent. Life is too short and there are too many beautiful gifts God has given all of us to share and experience for us to sit in the pews being bored. God is alive and active! I try to reflect that not only in what music I pick for Mass, but also in my everyday life. Where did you go to school? I received my undergraduate degree from Indiana University and earned an MBA from DePaul. What do you do professionally? I work in Marketing and Communications for a company named Kaufman Hall, which provides management consulting services and performance management software to healthcare providers, universities, and financial institutions. What do you like most about St. Vincent de Paul Parish? There are many things about the parish I enjoy — from the music and liturgy at mass and all of the great people who make up the community— but what I appreciate most about St. Vincent de Paul is the commitment to live the values of our patron and serve those in need. How long have you been attending mass at St. Vincent de Paul? I started attending mass at SVDP when I moved to Chicago in August of 2013. I am a graduate student at DePaul and was looking for a parish that was affiliated with the University. Where did you grow up? I am originally from rural North Carolina. However, growing up I spent time in Knoxville Tennessee, and Papillion Nebraska. Where did you go to school? I graduated from Papillion- La Vista H.S in Papillion Nebraska. From there I attended the University of Nebraska-Lincoln (go Huskers! ), graduating with majors in economics and history. What do you do professionally? Before moving to Chicago for graduate studies, I spent two years doing volunteer service work with two different Americorps programs. The first was a conservation corps based out of St. Louis MO focusing on disaster response, wild land firefighting and state and national park environmental conservation. I then spent the following year with an intentional community in St. Louis called the Vincentian Mission Corps. Currently, I am a full time graduate student with DePaul’s School of Public Service studying public administration with a concentration in metropolitan planning and urban affairs. What do you do professionally? I work at Coudal Partners on Field Notes Brand as a Marketing Associate. What do you like most about St. Vincent de Paul parish? The people and staff that make this church what it is. I have developed relationships through the years that have created such a supportive community environment and have made coming to church even more impactful. How long have you been attending mass at St. Vincent de Paul? It’s been about two months. I moved to Chicago from Austin, TX at the beginning of September, and I joined the parish soon after. Before you start worrying about a southerner moving north, see the next question. Where did you grow up? I lived in Rockford, IL until college and attended public school in Belvidere. For those of you who don’t know about Rockford and for those of you who know of it only as a stop on your way to Wisconsin, give it a visit. The city is moving in a positive direction. Where did you go to school? After graduating from Belvidere North High School, I studied finance and accounting at the Wharton School at the University of Pennsylvania. I then spent a year at the University of Texas at Austin. I suppose a PhD on the West Coast would complete my tour of the country, but a weeklong vacation there would be sufficient. What do you do professionally? I recently started working for PricewaterhouseCoopers on their transaction services team. I help businesses with complex accounting issues, business combinations, and raising capital. My mom asks this question each time I go home, and I’ll admit, my job isn’t the easiest to describe. How do you like to spend your time? Before moving to Chicago, I worked as a transplant coordinator. Currently, I spend my time on different volunteering projects like the Sandwich Kitchen and other community events. What do you like most about St. Vincent de Paul parish? Friendly people and the feeling of “home”. Plus, the opportunity to help people through the community. How long have you been attending mass at St. Vincent de Paul? I have been attending mass at St. Vincent de Paul for a little more than 10 years, since I moved into my Bucktown condo in September, 2004. Where did you grow up? I grew up on the West Side of Chicago, in the Austin neighborhood. Where did you go to school? I attended the now-defunct Our Lady Help of Christians grammar school. I also attended St. Patrick High School and Loyola University, graduating with a degree in Mathematics in 1974. What do you do professionally? I am a Service Parts Engineer at Electro-Motive Diesels in southwest suburban LaGrange (well, actually, McCook) and this past May celebrated my 40th anniversary with the company through three different ownerships, General Motors, Greenbriar and, currently, Progress Rail which is owned by Caterpillar. What do you like most about St. Vincent de Paul parish? 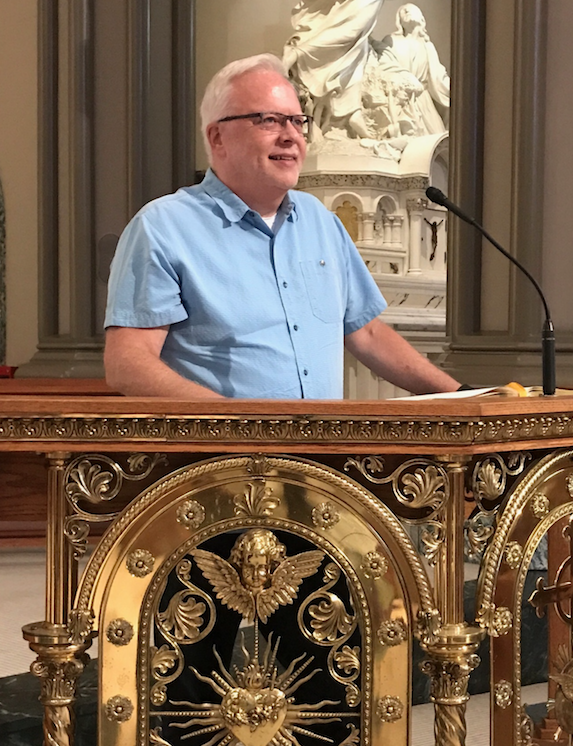 I enjoy the diverse congregation at St. Vincent’s, families, couples, singles, and the wide variety of both activities and commissions that the parish offers. Before I actually became a parishioner, I attended an Ash Wednesday service and was impressed by the number of people who were in church on a day that they were not obligated to be. It was then that I decided that St. Vincent’s was the place that I wanted to be. Where did you go to school? I attended Buena Vista University in Storm Lake, IA for my undergraduate program (B.A. in Leadership Communication & Spanish) and San Diego State University for graduate school (M.A. in Postsecondary Educational Leadership). What do you do professionally? I currently serve as the Assistant Director of Advising for DePaul University’s College of Computing & Digital Media, and teach group fitness classes (kickboxing) part-time at Cheetah Gym, Bucktown. What do you like most about St. Vincent de Paul parish? Being a parishioner at St. Vincent’s allows me to spend more time on DePaul’s Lincoln Park campus (as my office is on the Loop campus). Through Mass, commission involvement, and parish events, I feel even more connected to the University’s Catholic, Vincentian heritage, and appreciate the opportunity to get to know people that share the same faith.